This listing is for the label depicting a white background with black spots. No label date. Purchased over a year ago. Transparent golden-orange brew, but with an incredible amount of activity. Forms a very large off-white head with excellent retention and lacing. Lightly sweet, rustic, funky, and tart all at the same time. Just a touch of lemon, wildflower honey, hay, grass - smells like a meadow in Spring. Flavor is much lighter and more approachable than I would expect for Fantome. Light and sweet up front, with a musty dull edge. Stays sweet throughout, with a honey-like light cracker malt backbone and hints of flowers. 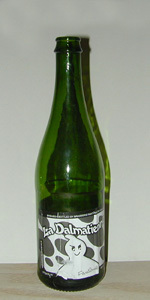 Mid-palate, a dry, dusty character not unlike dirt or aspirin emerges; lightly vegetal, as well, almost like peppers without heat. Finish returns to the light sweetness. Very lively and highly carbonated, which immediately impacts the palate, but quickly recedes to a soft, approachable feel. Effervescent up front, the finish is relatively wet, sweet, and long lasting. Absolutely no hint of the 8% ABV. As far as Fantome saisons go, this one is fairly straight forward, but there is enough rustic mustiness to give it a unique character. Got this from Hop City at Krog last week. No idea how old this bottle is, though I imagine it's on the newer side since GA just started getting this beer again (unless it's an old cache that had been sitting around forever, but I doubt it given taste/appearance). Poured into my Allagash tulip. Look: Deep golden orange with a lot of haze. Lots of carbonation and lots of white/off white/slight yellow head. Head retrained throughout drinking. Not as much lacing as I would like, especially given the head. Smell: Lemon, aspirin. I kind of smell grass clippings after the rain on a hot day. Having a hard time picking a lot up here. Taste: Chalky, medicinal old lemon candies. Funky lemon rind (not in a good way, the funk is almost bracing and more of an aftertaste than in harmony with the beer). Lemon-lime gatorade quality to it. Some grapefruity alcoholic notes. Slight tartness but by no means sour. Feel: Medium bodied with a lot of carbonation, goes down relatively easy. Overall: I definitely prefer the standard Saison by Fantome. There's something missing in this beer to tie it together--I think there's too much stale lemon dominating the palate. That said, for an ABV of 8%, it is very drinkable and went down fast. Smell and taste lemony and soapy. Herbal and too bitter. Leaves a bit unpleasant aftertaste. Nice look, good lacing, but no match to Saison Dupont. Overrated just like Fantome Saison. Had at torst in Brooklyn. Fantastic beer. Slight good n plenty finish but overall it's so well balanced and delicious. I wish I can drink this every day. White head. Yellow gold color. Flavor had an odd spice to it. Maybe dandelion. Spices and yeast. Lemon. Earthy and grassy. Clean. Slightly dry. Decent beer, just unexpected with that odd initial flavor. Poured from a (green) bottle into a modified tulip glass. A - Lemon yellow sun, filtering through the stratus layer of white froth. a horse in the rain! T - Interestingly sharp fruit, lemon reduction, a bit of onion peel, and moderate acidity, ash finish. F - Body is propelled across the palate, carbonation provides the surf for those sour notes, and a slightly sweet finish. O - This bottle is superb, the basis here is broad, tangy, bitter, sweet, funky. A true delight.